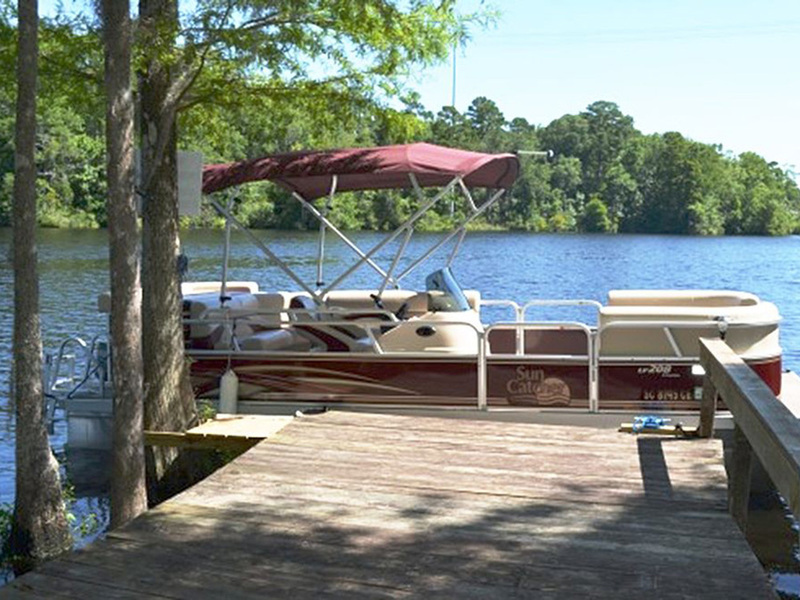 On the Intracoastal Waterway, Cypress Camping Resort offers a variety of rental unit options. All with complete kitchen (serveware, cookware, silverware), central heat and air, cable TV and wifi. I gave this place 2 stars based on the road conditions consist of pot holes through out the park, the sites have concrete for the RV but the area outside the steps is sand and dirt that turns to mud when it rains. The Bathrooms are a park model converted to 8 very small individual rooms, the sink is a very small sink with no hot water. There are RV’s there with full size refrigerator/Freezers outside along with other items that make the areas look cluttered and trashy. I would not stay there again. Their good Sam rating is not accurate base on what I saw. Easy to get to beaches , shopping etc.. nice park with lots of room to get in and out Nice friendly people. My only issue was the wifi was spotty at best. We stayed here in late April 2017 for a few days. We arrived very late at night and were greeted by a nice gentleman at the gate. We couldn't pull into our site because of the late hour so we parked it in their lot and caught some shuteye until about 7am. We pulled into our site, which had a concrete pad, grass, a firepit and table. All the utilities were easy to reach and worked perfectly. The restrooms and showers were clean and worked well, as did the laundry. They have a good office and store. It's located right on the intracoastal waterway so that's a nice bonus. It was a very quiet spot, even though there's a school at the top of the street and major roads nearby. With the major roads came all the conveniences also. Food Lion, pharmacy, Dunkin Donuts, gas, etc; right nearby. We had a peaceful stay. We'd stay here again. This was our first outing in our new Class C motorhome. We choose Cypress because of the location and reviews on the Good Sam site. We found the personnel extremely friendly and helpful. The grounds were in good shape. The restrooms/showers were nice in that they were all individual rooms, however, and this is not totally the fault of the workers, but we had to go into three rooms before finding one that did not have waste in the toilets. I am not sure why it is so hard for people to flush when done. Anyway, possibly the installation of automatic flushers would help. We also found the wireless connection to be very spotty and slow. We enjoyed ourselves enough to return. We traveled with our two children and dog in a small travel trailer. It's very dog friendly and staff was pleasant. We wanted a quick getaway for the New Year. I think in the summer, this place would be nicer to stay at with more to do. You can't rent the kayaks or anything in winter. It's a small campground. Only one short trail around the pond which sadly was littered on one side with lots of discarded bottles and trash. Bathrooms are individual private bathrooms which is nice, but as others have said, very small. No place to set your things down and a sink so tiny you can barely brush your teeth in it. The pool was obviously closed, but looked nice enough. The sites were clean, most were level. The waterway is pretty. My biggest con about this place was that you could hear highway traffic the entire time. It's sandwiched between a highway/busy area, a neighborhood and two schools. If I had realized that, I would have booked somewhere else. If you are looking for a home base to enjoy all the Myrtle Beach attractions, this is a good spot. If you just want peace and quiet then not so much. Lovely spot right on the ICW. Very close to all shops and places to visit. Staff are very friendly and helpful. Roads need some work - pot holes near exit. I would definitely stay here again. Staff was nice and efficient. There was a security employee golf carting around the premises after the office closed. Docks along the waterway were well maintained and a pleasant place to watch watercraft. We even spotted an alligators floating by. Restrooms were numerous, clean and private, albeit a little small. The laundry worked well and although we should have been out by 10pm, security didn't bother us while we waited for the driers to finish our cloths. Sites were concrete, in good shape and not cramped together. Cypress Resort was close to shopping and restaurants, but a very quiet location. Thanks, we would stay there again. arrivied after large rain storm, had nice pull thru lot for us. grounds were not "flooded" with puddles. picnic table could be closer to campsite. bathrooms were small but nice. felt private . pool was nice , and the cafe was a nice touch for breakfest.nice walk around the pond the turtles were fun to watch. we filled up with propane right there. service was friendly. just stayed the one night, was a great stop!